Closely related to journalism, marketing and advertising, public relations is a multi-faceted field that bridges the communication gap between organizations and the publics they serve. Students who choose to get a public relations degree at either the associate, bachelor’s or graduate level will be prepared for a range of steadily growing careers. This guide outlines the field of public relations, including the education, skills, and experience a public relations degree can bring. Matthew Cabot, PhD, APR, is an associate professor of public relations and mass communications at San Jose State University. He has previously taught at California State University, Long Beach and worked as a senior account executive for a marketing communications agency in Los Angeles. As a scholar, Cabot has published in The Journal of Mass Media Ethics, The Journal of Communication and Religion, and Media Ethics magazine. Because the public relations sector of any business plays a crucial role in regulating the satisfaction of the company’s customer base, there are a variety of schools throughout the country offering programs in public relations to fill this need. Students studying in one of these programs will develop skills in marketing, advertisement, and even elements of journalism in order to facilitate a company’s success. By looking at a school’s statistics including student success rates, student population, and cost of tuition, we’ve found the best schools available throughout the country. 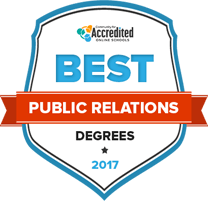 Check out our ranking for the 2017 school year below, and find the best public relations program for you. Students and professionals following the public relations path have to become masters of multiple specialties. Public relations is founded on strong communications, and combines elements of marketing, advertising, journalism and other media to build an organization’s image, reach out to the public and ensure that a mutually beneficial relationship remains between the two. Similarly, many public relations degree programs are generally feature a curated mix of courses from other specialties within a school’s journalism and communications departments. Principles of advertising and design, media writing, business practices and sociology may all be addressed along with courses specific to public relations. jobs. According to the U.S.
look a little better. That may have been the case in the past, but today we live in an age of transparency. If the goal is to build mutually beneficial long-term relationships between the organization and its stakeholders, if you do anything that undermines trust, you’re going to hurt that relationship. If one aspect of public relations stands out more than the others, consider checking into one of these related degree programs. Like PR, communications degrees cover a range of different activities, skills and careers. Programs usually starting by honing the basics: speech, writing and social sciences. Advanced degrees allow students to take more direct paths within communications fields. English degrees can focus on literature, language study, writing or a combination of the three. Reading, analyzing and writing about various forms and works of literature are a large part of many English degree programs. Prospective students who are interesting in taking on leadership roles in a variety of settings may be well-suited for management degree programs. Managers are needed in all fields, and management education can be applied in a variety of settings. All public relations degrees can help give students the skills needed to enter the PR field, but different degree levels will open students up to varying careers. While the field overview gained by an associate’s degree in public relations can help students get their feet in the door with entry-level PR jobs, an established professional looking to change careers or take a higher position may be more suited for a master’s degree program. A public relations associate degree program may provide theoretical and practical study through a combination of courses that introduce students to the principles of public relations and practicum or internship courses where students can apply what they’ve learned in real-life settings. Students who earn an associate degree in public relations will be prepared for entry-level PR jobs, or they can continue their educations at the bachelor’s level. The courses offered in public relations associate degree programs can vary, but typically they provide students with an overview or introduction to various aspects of the field. An introduction to communication theory and practice, the history of mass media and an examination of the business side of mass media in the U.S. Advertising and public relations will also be introduced. An exploration of the diverse cultures and gender issues within the U.S. media, racial and gender roles that shape the media and media roles that influence U.S. race relations and racial change. The introduction and practice of different styles of writing for print, broadcast and web media as well as advertising copy and public relations materials. Students will learn about legal implications of media writing and how to write for specific audiences, gather information and check for accuracy. A practical, on-campus public relations experience. Students will have the opportunity to write media releases, produce promotional materials, plan events, write scripts and create presentations. Public relations bachelor’s degree programs tend to go more in-depth than associate degree programs. Students will have the opportunity to explore PR-related topics in more depth and may be exposed to specific components of PR, such as writing for different audiences, graphic design, broadcasting, management or business. Strong research skills are very helpful in bachelor-level PR programs, and students should be prepared to apply their classroom skills and knowledge to practical settings through group projects, internships or study abroad opportunities. Bachelor’s degree programs may have a greater range of topics than associate degree programs, giving students the opportunity to take more subject-specific courses related to PR. A look at ethical concepts and issues on the societal and individual levels in relation to public relations and advertising. Personal and professional ethics based on traditional teaching, modern codes and other guidelines will be studied. Prepares students to meet the demand for PR and communication professionals who understand related business and economic principles. Traditional and emerging business models for PR agencies will be explored along with the business aspect of managing communications in corporate, government or nonprofit settings. An introduction to research techniques, paying particular attention to applications of strategic planning, opinion research, message evaluation and theory testing. Both qualitative and quantitative methods will be addressed, along with data analysis. An intensive hands-on writing course designed to provide students with an understanding of proper writing styles, keeping in mind different goals, situations and media. Writing mechanics, grammar, headlines, structure and the ability to express information clearly to an intended audience will all be honed. Master’s and doctoral degree programs in public relations tend to have much more hands-on work than undergraduate programs. Practical applications, examinations of case studies, and delving deeper into topics addressed in undergraduate courses may be the focus, giving graduate students the opportunity to build off of their previous education, which is typically required. There may be more student-led discussions in class rather than an instructor-led lectures in graduate courses as well. Students pursuing graduate degrees in public relations should see more opportunities for advanced careers in public relations and related fields. Use theory and practice to create public relations campaigns and programs for clients in a variety of contexts. Methods include research, planning, implementation and evaluation of plans. A look at behavioral sciences as they apply to consumer decision-making and the application of theories to develop consumer behavior research studies, advertising and public relations programs. An introduction to crisis communication and management from a strategic, theory-based approach. Relevant historical and business case studies will be examined. A study of the history, theory and practice of public relations on a global level. Before diving in to a public relations degree program, students can ask themselves a few questions to make sure they choose one that is right for them. Does it meet your educational or career goals? Students can take a look at program profiles and course listings to see whether their public relations program offers courses and goals that align with their own. It’s also a good idea to check out the school’s campus or talk with students already in the public relations program to get a good feel for it. Accreditation is an optional evaluation process that schools and programs can undergo to show that they adhere to specific quality standards. While there isn’t an accrediting body specific to public relations programs, students should make sure their schools or programs are accredited by one of the U.S. Department of Education’s regional accrediting bodies. Students should find out if scholarships, grants or loans are offered by their school or program of choice. Keep in mind that federal financial aid is only available for programs accredited by bodies recognized by the U.S. Department of Education. Does the program offer real-world experience? Some public relations degree programs have internships, practicum or even study abroad programs that let students apply their skills in real-world situations. Students interested in these opportunities should make sure that they are offered by their PR program. Public relations is a rapidly evolving field, and students should make sure their degree program will prepare them for the future of public relations. Prospective students can look at course listings on their school’s website and see if the descriptions include new ideas, innovations and forms of media. Is there opportunity for specialization? Especially in bachelor’s and master’s degree programs, students may have the option to take classes suited toward specific PR-related interests. A public relations student who is drawn toward the writing aspects of PR should make sure the program has plenty of opportunities to explore and hone those skills. Another student may seek out a program that covers graphic design principles. relations professional has expanded. Only 10 or 15 years ago, the role of the PR person was a little bit more limited in terms of gaining publicity and doing promotion work. Today, that role has expanded greatly, partly because of new media and social media. Public relations specialists help execute plans to develop and maintain an organization’s positive image. They may use various media, from social networking to newspapers, to promote their organization and communicate the organization’s image to the public. Public relations specialists can also tackle unfavorable situations an organization may face, draft speeches and press releases and use media to evaluate the public’s opinion of the organization. Public relations managers help organizations develop their identity. They plan, create and execute campaigns to express this identity to the public and maintain a positive public image. Public relations managers create press and media releases and supervise other PR staff to make sure campaigns are effective and well-executed. Closely related to public relations, these managers create campaigns to generate interest in products or services. They use print, radio, television and online media to promote their companies or products through advertisements. Public relations specialists are sometimes thought of as spin-doctors whose job is to put forth a positive image regardless of the situation. However, the modern world is a transparent one, and it’s vital that public relations professionals are honest and can rightfully earn public trust. Writing remains a key aspect of public relations careers. Whether it’s drafting press releases or spreading the word in 140 characters, strong writing skills are a must for PR professionals. Understanding the current social climate is essential in building relationships with the public and gauging its reaction to news, events and various PR efforts you may be working on. Being able to pick out ideas before they become trends can be extremely helpful in devising successful public relations campaigns. A large part of public relations is figuring out the best ways to create positive relationships between organizations and their publics. Strong problem solving skills can help PR professionals create effective relationship-building strategies and also come in handy when dealing with negative events that could hurt relationships. While it’s not necessary for all public relations careers, prior experience in sales or marketing can be helpful. The communication, public engagement and image-building elements or marketing and sales all play heavily in PR, and experience with them can give PR professionals an edge. The APR credential is offered by the Public Relations Society of America to strategic PR professionals who show they adhere to certain standards of practice. Applicants must sit for a readiness review and pass an exam.